We visited San Francisco a few times and we loved it every time. 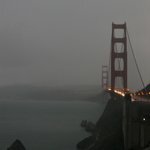 This time however it was in December and it was raining hard and the San Francisco Bay was covered in thick fog. We ended up mostly driving around but we were still able to walk around Fisherman Wharf area and enjoy the sites. San Francisco is spectacular despite the rain. Read on to find out the main tourist attractions in downtown San Francisco. As I think of mysterious places in California, Alcatraz Island comes to mind right away. The scene of many movies and known as “The Rock”, Alcatraz Island is a mysterious place. It is so close to shore and yet far enough. 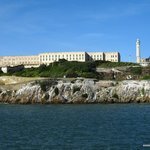 It’s interesting to read about the escape attempts that have made Alcatraz Island famous…history has not recorded any successful escape attempts. All those that have at least made it into the water have drowned on their way to the San Francisco coast. Enveloped in mystery and many times in fog, Alcatraz Island attracts the visitor.